Updated July 28, 2016: On July 26, 2016, Solar Impulse 2, a zero fuel airplane that uses SunPower solar cells, set a world record for by becoming the first solar plane to fly around the world. As Solar Impulse 2 (Si2), the solar powered airplane that uses SunPower® solar cells, prepares to break a world record and become the first solar airplane to fly around the world, we congratulate the team for demonstrating that clean energy technologies can make the planet healthier for future generations. The solar powered airplane is a flying laboratory for fighting climate change. It’s pioneering advancements in solar energy, energy efficiency and solar power storage that have real world applications in your car, home or business. SunPower was chosen for the project because we design and manufacture the most efficient1 and durable2 solar cells available. As pioneers in the solar industry for 30 years, we’ve always been drawn to work with adventurers pushing the limits of solar technology. From the Honda Dream, a solar racecar that won an 1,800-mile race across the Australian Outback 23 years ago, to GROVER, a NASA rover that explored Greenland’s icecap, SunPower solar has helped set many records. And that same technology is used to make our residential, commercial and power plant solar panels. As the 21,000-mile Si2 adventure draws to a close, here are a few of our favorite moments from the 16-month journey, which is scheduled to soon end where it began, in Abu Dhabi. On July 3, 2015 CEO, co-founder and pilot Andre Borschberg broke world records for longest solo and solar flight with a five day/five night flight over the Pacific Ocean from Japan to Hawaii. In April 2016, after a setback grounded the plane for months in Hawaii for battery repairs, pilot, chairman and project initiator Bertrand Piccard resumed the trip with an epic flight from Hawaii to San Francisco that was captured with inspiring photos of the plane soaring over the iconic Golden Gate Bridge. 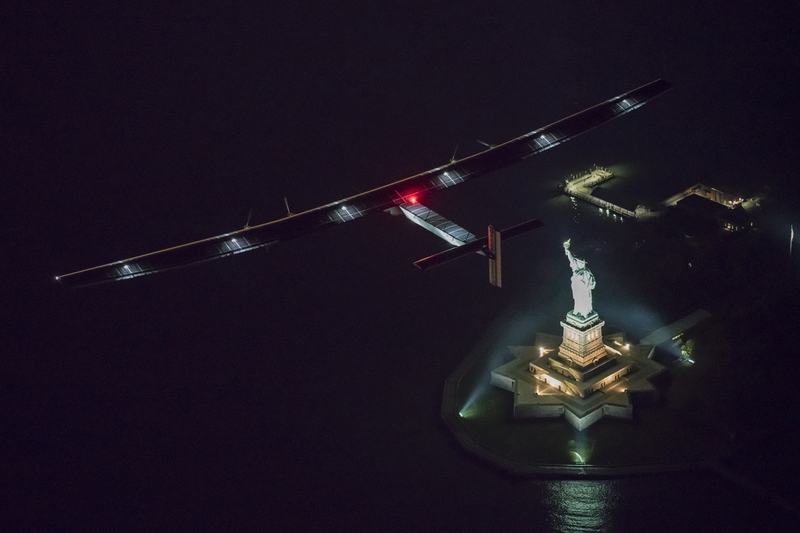 After several flights across the continental U.S., June 11 the solar powered airplane flew by the Statue of Liberty in New York City, an emotional moment made poignant by a statue that symbolizes freedom and a plane that symbolizes a world that’s free from air polluting fuel sources. On June 23 the plane became the first solar aircraft to cross the Atlantic Ocean when Piccard flew from New York to Spain. It’s currently in Cairo, Egypt, where it flew by ancient pyramids believed to be the only intact Seven Wonders of the World. While we’ll miss following the adventures of Si2, we’re inspired that the true purpose of the project — improving the health of our planet by reducing carbon emissions with clean energy technologies — has only just begun. Kudos to the Solar Impulse team for recently announcing that it's establishing an International Committee of Clean Technology to continue the legacy. We’re proud that SunPower’s mission of changing the way our world is powered played such a pivotal role in advancing dreams of a cleaner future. Visit the Solar Impulse website to sign up for alerts about when the final flight from Cairo to Abu Dhabi will take place. 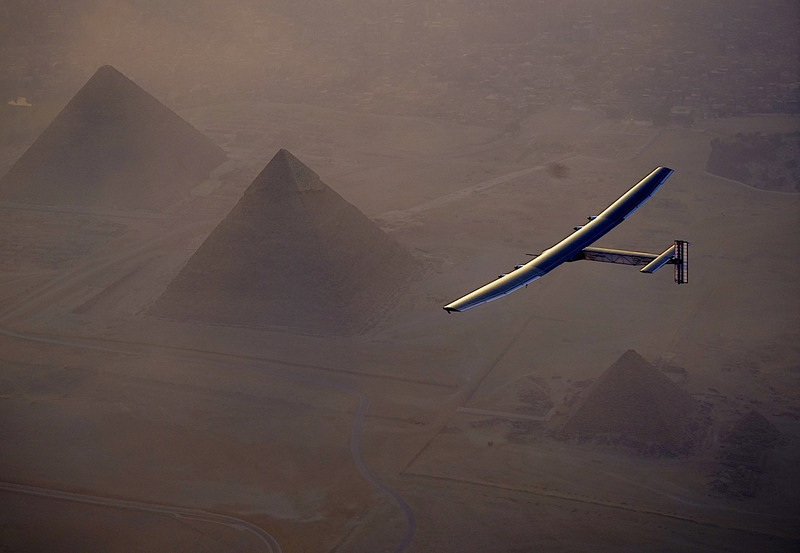 You can watch the entire flight live on the Solar Impulse YouTube feed. ​1 Highest of over 3,200 silicon solar panels, Photon Module Survey, Feb 2014. 2Fraunhofer PV Durability Initiative for Solar Modules: Part 2". Photovoltaics International, 2014.